Koike Aronson Inc./Ransome, Arcade, NY, a manufacturer of cutting and positioning equipment for the metalworking industry, introduces the Anti-Drift Turning Roll, which uses Koike’s patent-pending eccentric axle design to minimize vessel drift. 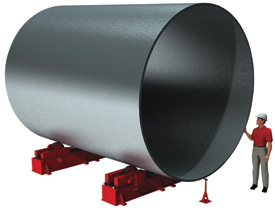 The turning roll allows for a lower vessel centerline height and holds the vessel on rolls axially in position within + 0.04 in. It automatically compensates for vessel irregularities and roll misalignment, making corrections quickly and with little force. The machine’s simple, low-maintenance design eliminates unreliable moving bases and vertically moving wheels. See also: Koike Aronson Inc.